People fleeing violence and crossing the border into neighboring countries, taking the infection with them, add additional risks, said Salama, adding that measures at crossing points are being implemented. 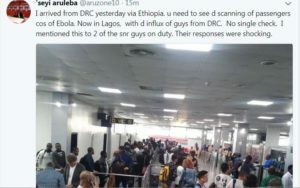 The main challenges during the previous Ebola outbreak in Equateur province involved tracing anyone who had come into contact with suspected carriers of the disease. In some cases, WHO staff had to travel hundreds of miles on a motorbike to do this work, said Salama. A total of 43 cases of hemorrhagic fever have been reported in North Kivu province, of which 16 are confirmed and 27 are probable, said the ministry. Authorities are investigating an additional 46 suspected cases, according to the ministry. Containing the deadly virus amid the high level of insecurity in the Kivus could prove to be even more challenging, he added.